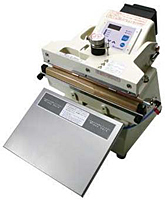 This impulse sealer combines microcomputer machine control with a highly sensitive thermocouple-based temperature control system to maintain the sealing area at the set seal temperature regardless of the surrounding work environment or increases in the unit's body temperature. Featurting ONPUL system, our original, innovative sealing system, the heating temperature is controlled by directly detecting the heater temperature using a low-profile temperature sensor that comes in contact with the heater. The initially set sealing condition will not be affected by the work environment or by extended use. The operation is very simple. Use the touch panel on the control unit to set conditions such as the heating temperature. To set the settings, use the Mode Swith. After setting the appropriate sealing condition for the packaging material. select either automatic continuous operation or manual air-pedal operation. The OPL-200 and OPL-300 series of sealers also offer a selection of different methods with which to press the table switch plate. If the table is required for the OPL-450 and 600, use the FA stand combined with a special table. Good for seal lengths of 200mm/ 7.8″, 300mm/ 11.7″, 450mm/ 17.5″, and 600mm/ 23.4″ as well as the seal widths of 5 mm/ 0.19″ and 10mm/ 0.39″. Available only as a single-side heating type capable of seakling material up tp 0.3mm/ 11.8mil thick in total thickness of overlapping sheets. Sealing an oxygen scavenger inside a gas barrier material packaging can help a product life. Optional working tables, working stand, and the hot stamp printer, FEP-N1 series are aveilable on request. Also each unit features the the anti-finger jamming feature and the control unit prevents over heating. Quality consistent sealing unaffected by temperature changes in the surrounding environment or the extended use. Reduces unnecessary heating by controlling the heating temperautre. A choice of operation methods— auto cycle, foot pedal or table activated. Seal pressure may be adjusted to accommodate various films and thicknesses. Higher volume packaging that require constant use over an extended period of time. Applications that require uniformly consistent seal precision and strength. Packaging that requires sealing single-layer PE, CPP or OPP films at the proper temperature every time. *Other voltages available on request.